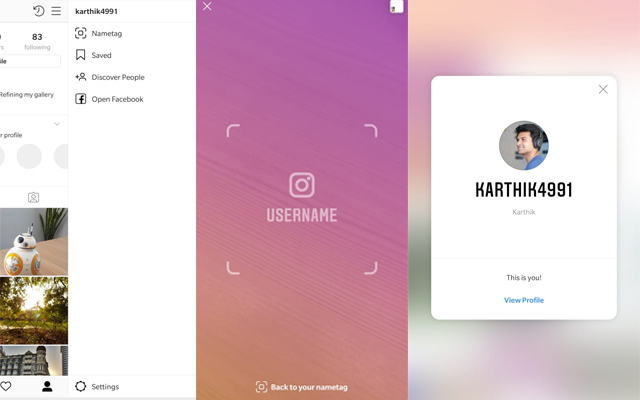 A few months back, Instagram started testing Nametags to make it easier for users to find someone on the platform. Well now, Instagram has finally started rolling out the feature globally to all users. Nametags essentially work like a QR code which can be scanned to quickly find someone’s account. Yes, it sounds like Snapchat’s ‘Snapcodes’ feature, but this isn’t the first time Instagram is copying a feature, so I am not surprised. The nametag, in case you are wondering, puts your Instagram handle along with your profile picture front and center. By default, it shows the Instagram gradient color in the background, but you can customize this to show different colors, emoji, etc. Heck, you can even choose to show your selfie along with some cool filters. Head over to your profile page and swipe left or tap the menu button on the top right to reveal the new nametag option. Once you hit it, it will show you your default nametag, but you can choose to customize this here. Additionally, you also get an option to share your nametag with your friends via your preferred medium. To scan someone else’s code, you can simply swipe right into the camera and scan the code on the web, or you can take a screenshot of the code and use that instead. It will automatically scan the code even if you only have a screenshot, following which you can follow or visit the person’s Instagram profile. The Nametag feature is available now on Android and iOS, so be sure to check it out. Anyway, what other Snapchat-inspired feature would you like to see on Instagram in the future? Let us know by dropping a comment down below.